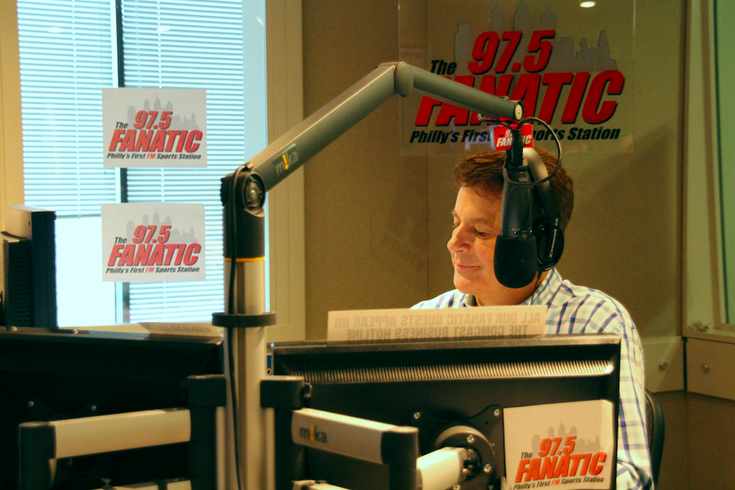 Mike Missanelli, sports radio personality for the ESPN affiliate, 97.5 The Fanatic, in Philadelphia, preps for his morning radio show. After 21 years of "Daily News Live" and then "Philly Sports Talk," NBC Sports Philadelphia will finally retire the long-running afternoon panel series in March. The network revealed Monday that it will expand broadcast hours for "The Mike Missanelli Show," which simulcasts the host's radio program as it is broadcast on 97.5 The Fanatic. Beginning March 4, Missanelli's show will air Monday through Friday from 2-6 p.m., replacing the previous Philly Sports Talk program slot from 5-6 p.m.
"We're pleased to extend 'The Mike Missanelli show on NBC Sports Philadelphia, and it's been a welcome addition to our lineup since joining last year," said NBC Sports Philadelphia President Brian Monahan. "We remain committed to developing engaging content across multiple platforms." The decision to move on from "Philly Sports Talk" is the latest move in a long-term overhaul of the regional network, which had already parted ways with some of its most recognizable anchors and reporters in recent years. In October 1997, "Daily News Live" launched with Michael Barkann at the helm of panels of the namesake newspaper's sports writers, as well as guests like Charles Barkley, Kareem Abdul Jabar, Rob Reiner, Jim Cramer and Jon Bon Jovi. The show became "Philly Sports Talk" in 2013. Barkann moved into a different role with NBC Sports Philadelphia last spring, taking on game day coverage responsibilities for all four major local teams. Amy Fadool and Marc Farzetta, who took over as co-hosts of "Philly Sports Talk" last year, will each have different responsibilities with the company after their final show airs on Friday, March 1.